Well, it’s going even better for Typhon. The Sagely Spaceman figured out how to get Typhon off of Pluto! The Spaceman fixed up some old portal generators, and Bob’s his uncle! Not that creating a portal somehow altered the Spaceman’s family ties, it’s just that he used some long-forgotten Inomium canisters which had been given to him years ago by his uncle Bob. In any case, it’s fortunate that the Sagely Spaceman found them canisters. According to him, both Inomium and circles are necessary for a portal to function properly, and we certainly don’t Typhon traveling through a malfunctioning portal! I’ll keep this short, since the Sagely Spaceman said this portal I’m supposed to go through will only stick around for nine more minutes. To make a long story, uh… less long, the Spaceman figured out where to send me. He dug up some old portal generators and Inomium canisters and fired up a portal! The thing is, he doesn’t quite know exactly where the portal leads. Traveling through it, I could basically end up in any universe. This is slightly less than ideal, but I don’t have much choice. I can’t stay on Pluto forever. (The sub-350 degree temperatures don’t agree with my constitution!) Though life on Pluto might sound fun and interesting, I’ve found it to be rather monotonous. The fact of the matter is, I am going through that portal, and I can’t return because the portal is one-way. For all I know, I could end up in a worse situation than the one I’m in now, but I’ll never find out by just standing here for another five minutes. And what kind of adventurer would I be if I did that? No, I’m going through the portal, for better or worse. Enjoy the snapshot! 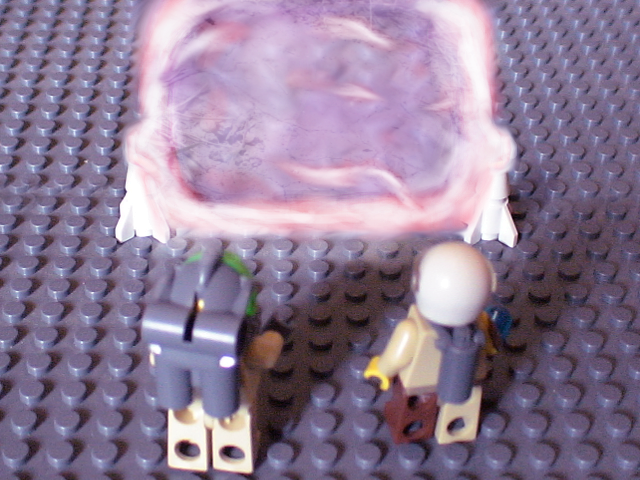 The Sagely Spaceman and Dr. Garlic at the entrance to the portal. I can’t help but wonder just what world Dr. Garlic is going to! I guess we will all find out soon, but in the meantime, why not leave your speculations in the comments? Be prepared for a fuzzy feeling in the portal! Well, since I’m privy to his top-secret location (unless you changed, it Peter? That would be awkward), I can’t really speculate!